Max Headroom was a merchandiser's dream: a distinctive, unique entity that could be attached to every imaginable product and promotion. This too was a short era, but the number of Max-themed products and productions is truly staggering. This page is an incomplete but continually evolving list of all known Max products. Contributions and suggestions are more than welcome! 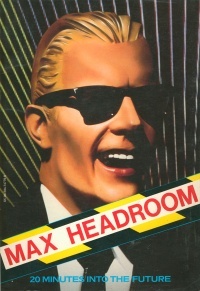 Max Headroom was released on home video in such a chaotic manner that the scanty offerings go beyond being simply Max products. The background, the history and the offerings over 30 years warrant this page of their own. There appears to have been an aftershock of Max-ness in northern Germany in about 1989, just as the Max fad was crashing in the US and UK. Novelizations, German-language audio re-performances and techno club dance mixes were all produced in this short window. I've pulled together separated writeups into one page. Really, there's no other word for most of it. I haven't found many useful, practical Max Headroom merchandise items, except maybe the watches. So here's a gallery what will be an eternally expanding listing of... junk. Note that most Coke items - a vast number - will be found, eventually, in a separate gallery, although there's some overlap here with items that are not strictly promotional (such as the skateboard). Your contributions of items not seen here will be welcome and credited. All gallery pictures can be clicked on to view in larger form. If you dare. A few of the many Max buttons including two Coke promos. Max air fresheners, still smelly 30 years later. Max trading cards. There were at least two sets. One trading card back image, assembled. Note secret message. Max skateboard. Legs not included. Max ventriloquist head (about 12" high). Max foam finger puppet, about 5" high. Max foam finger puppet rear controls. Some Max dress-up items. Suspenders... wow. Max sleeping bag... sweet dreams. Yardage of the three-panel fabric is also occasionally seen. 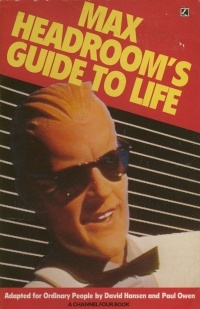 Max Headroom was the subject of three books published during his heyday, plus some outlying efforts. The 1985 picture book of the telefilm, front cover. 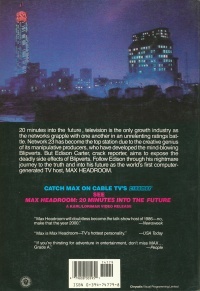 The 1985 picture book of the telefilm, rear cover of the US edition. This book is a 64-page picture-book retelling of the original telefilm. It was published in 1985 by Corgi in the UK and then Random House in the US, and a German translation was published soon after. Copies are not common but can be found. The 1986 Christmas annual cover. This is a Christmas annual picture and trivia book in the UK tradition, produced by Grandreams Limited. Although undated, this 64-page hardcover was likely released in late 1986 for the Christmas market. Christmas or year-end annuals have been published in the UK for well over a century and are a distinct market from other books, magazines and periodicals. Annuals are produced for perennial subjects and hobbies as well as sports teams, fictional figures and popular television shows. The content is a mix of puzzles, games and Max-isms culled from the shows through that point. There is no credited writer or editor. This appears to be the rarest of Max books, with only one copy found for sale online. 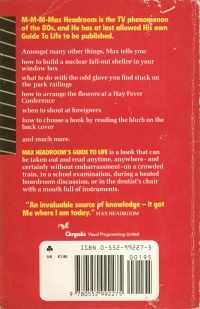 The 1986 lifestyle guide by and for talking heads, front cover. This is a very of-the-era collection of rules, witticisms and sayings dictated by Max and published in 1985 by Corgi Books. Its 144 pages were authored by David Hansen and Paul Owen, who wrote material for all of the talk shows and were credited for material on the ABC series as well. As much as Max was created by others, Hansen and Owen seem responsible for Max's long string of humor and acid observations. It is plentiful in used book listings. 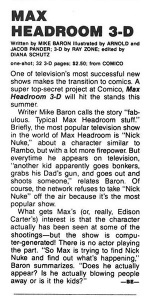 A 1987 notice for the Max comic book. 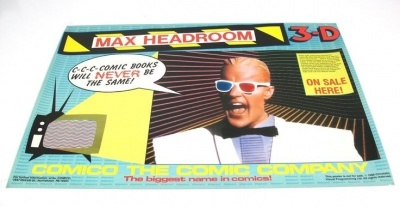 What may be the most interesting Max book of all never actually appeared: a Comico 3D Max Headroom comic book that was announced, generated marketing materials including a poster seen at a number of comic and media cons... and then vanished with the rest of the Max phenomenon. 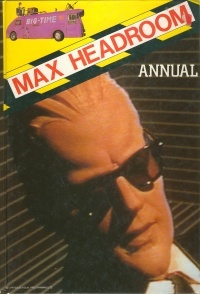 A series of novelizations of Max Headroom episodes were published in German in 1989. Somewhat oddly - in my opinion - there were no other novelizations, continuation stories or other books published in the Max continuum, even though such books are common for heavily-merchandised shows. It's possible that an English-language novelization or extension series died in development with the abrupt end of the series and Max-mania. 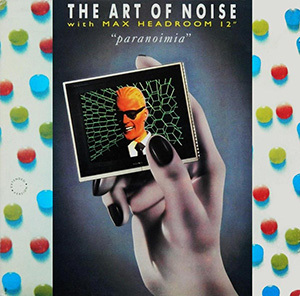 Max appeared as a guest spea-speaker on the reissue of The Art of Noise's single "Paranoimia." The techno/synth dance tune first appeared on their album "In Visible Silence," and was then re-issued in a 7-inch single and video version with Max providing eerie spoken vocals, and a 12-inch extended play single with a different set of Maxisms. See: Max: Appearances & Interviews for more details. 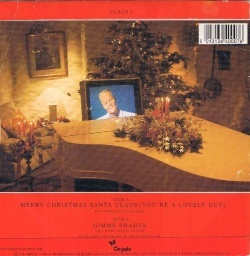 Cover of the 1986 single with scene from the Christmas Special. Rear cover of the single. 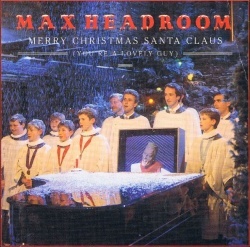 On the 1986 Christmas Special, Max sang several songs including these two, which were released as a Chrysalis single. By some accounts, it sold poorly due to a late release in the season. Matt Frewer had a very acceptable Sinatra-like voice and sang many songs, mostly somewhat silly, on the shows beginning with the last episode end of Season 2. He sang only a few snatches on the ABC series. These are the only two to be formally released as audio recordings. A series of German-language radio plays or audio re-performances were produced in Germany in 1989. A number of techno club dance mixes under the Max Headroom name and with Max-ish elements were produced in Germany in 1989. There are a few Max things out there that just defy classification. 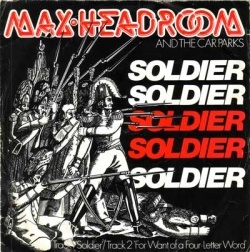 Most appear to be other uses and inspirations from the common British car-park term "Max Headroom" and thus not really part of the Max phenomenon... but let's include them anyway. Front of the very rare predecessor to the Max Headroom name. Max Headroom & the Car Parks was a very minor early-80s British band about which little is known. They had at least one 45 released, which is quite rare and often seen in the $50-100 range from collector sites, probably because of our Max Headroom. The 45, titled "Soldier" and backed with "For Want of a Four-Letter Word," lists Mick Ruck, Laurie Garbe, Fred Legg, Ade Gullis and Chris Pullen as members, and was released in 1982 by Bandwagon Records. The MaxRchives holds a copy of the single but technical limitations mean we've never listened to it. There is a current band of the same name with listings on Facebook and similar places, but it appears to have no connection to the earlier one. It may be the current Dutch power trio named "Max Headroom," formed in 2010, that "plays entirely improvised stoner rock jams." Or not. Even stranger, a 45 labeled "Rythm & Blue Beat" (sic) by "Max Headroom & the Car 'Parks' " has shown up, released in 1980 by Parlophone/EMI, with the sole credit being producer Bob Clifford. Just how many iterations has this band (name) had? Hard to say, but then there's a group named 'X.S. Energy' that released a 1979 single titled "Eighteen"... with lead guitar and vocals by "Max Headroom" (who was backed by Nicky Teen, Mark Up and Freddie Voltage... s-something makes me suspect stage names at play, here). This page was last modified on 1 January 2016, at 13:27.